David Ogilvy on Social Media. How a “drug-taking college dropout” created one of the most successful corporations in the world. The Secrets of the biggest-selling launch ever. The ad at the top of this post alone is worth clicking over for. Beyond that, Mr. Vodden has very aptly applied some of Ogilvy’s core philosophies to good social media marketing. All right, all right, you’ve had enough of the Steve Jobs onslaught. I have too, but when a BBC documentary gets out into the wild (if it’s still up now), how can I not link to it? Your Readers are Changing. Are You? A quick look at how these old-school monoliths are nimbly dancing (and winning) on social networking platforms. A clear (and bold) primer on what content marketing is and does, as well as its advantages over traditional advertising. Very informative links, it will be a mistake not to read them. Thanks for sharing. The One Resolution You Need to Make in 2012 is, in my opinion, the single most important philosophy you can follow in business and in life. Do what you say you’re going to do! Always! Most of us are so busy that accountability can be the first thing out the window. We start to think the small things, like returning phone calls when we said we would, don’t matter. When you’re dealing with people, there are no “small things”. Everything counts. The links may be cool, but I’m really disappointed that this made it through the Copyblogger filter. No story. No nuggets of wisdom. Just links. 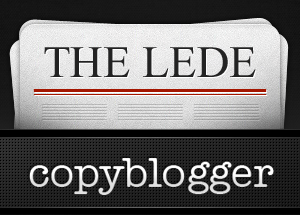 That’s precisely what The Lede is Todd, a weekly curation of marketing related links. I get that. I just expect more from this site than to just throw up a few links with brief descriptions and call it a blog post. Got it, you’re not into the curation thing. The headline is fairly explicit, so you can easily skip these posts in the future. They created their twitter account in 2008 and Bepko has had it for a year. He spends “about a third of his day” on twitter. They have 90 gajillion followers. He didn’t build the following and the article has nothing to do with that. I think it’s about a guy who gets paid big bucks to delete negative tweets about “Whole Paycheck” (as we call them in Seattle). Chrysler? Best Buy? None of that has anything to do with ANY of your readers. Fail. Thank you for failing as I’m sure that means the next link to an article about twitter will have nothing to do with global mega-corps with more money, time and resources than god and everything to do with real-world bloggers. The words that go into this megaphone need to be very carefully thought out. I think that link was phoned in. N.
I’m sorry you felt that link was phoned in Norman. Try this one. Or this. Or this. Or this. Or this. Maybe this. Or perhaps this. Wow, Robert, you’re taking some heat for these links. My apologies in that regard. For what it’s worth, I appreciate being included on this list. Thank you for linking to my “Beginner’s Guide to Content Marketing” post. I had a blast writing it and appreciate your linking to it. I appreciate your reply to my post as it was in the spirit of The Lede; a simple list of valuable links. I think it’s a great concept and I get a ton of value from it, mostly. Interesting how key point that’s repeated over and over by twitter experts is to be absolutely sure your link is strong. That was my only point. I often keep The Lede in my inbox for 2 to 3 weeks to browse through for inspiration and even then, it gets archived, not deleted.